Creating a unique character for a video game, animation, or even a toy figurine involves having fine arts skills reinforced by a strong design process. 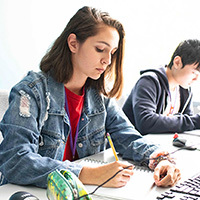 Initially, students will study basic concepts, including how shapes, colors, and different approaches influence and work together for successful character design. Students will then progress through the creation of several of their own characters using both traditional and digital media. 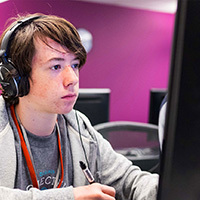 In Exploring Games, students will play a selection of video and tabletop games, and study what makes them fun to play. They will then work in teams, to play-test and use constructive criticism to make their own game into something they will be proud to show off to friends and family. Do you love those fun dance moves in video games? Learn how to animate them yourself! With the help of a character rig, students will explore the creation of movement while learning about the principles of animation. We love our board games, but why get stuck thinking about keeping everything in a box? Innovate and construct something Out of the Box in this hands-on, get-messy mini workshop. 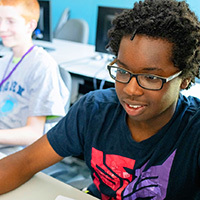 Students will learn the history of games, basic game mechanics, and the game production pipeline- including design, prototyping, and production. Ever wondered how to make your own screensaver? Look no further! In this class, students will learn about the design, art, and programming behind creating a screensaver. From bubbles and bouncy balls to ribbons and rockets to marbles and minigames, students will learn the art of crafting calming entertainment.